An icon is defined, among other things, by its longevity. Icons don’t withstand change - they endure it, by evolving with the times. An icon adapts to each new era, maintaining its identity while simultaneously remaining contemporary and fresh. At their best, icons provide both a connection to our past, and a window into our future. For almost 30 years, Windows has been an icon among icons, creating portals into new worlds by providing users with an entirely customizable experience that progresses as fast as they do. Windows is used by over a billion people each day, from air traffic controllers to NASDAQ traders to obstetricians. Which is why the Windows Hero Desktop Image is easily one of the most widely recognized images in the world. It’s the first thing users see when they begin their Windows experience, and it’s featured in every Windows ad that’s shown in nearly every country in the world. In 2015, Windows evolved yet again with the release of Windows 10 - the final major release of Windows before it moved to quick-turn digital updates. 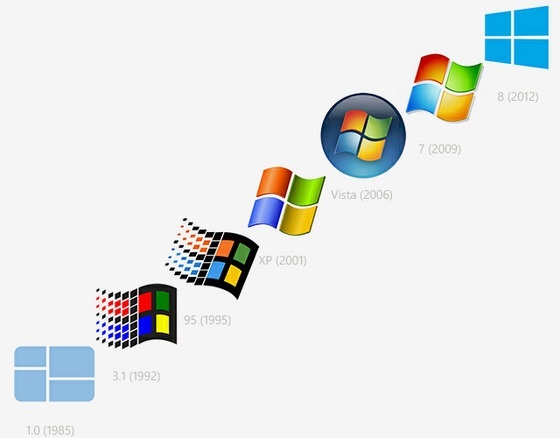 To mark this evolution, we had the pleasure and honor of creating the Windows desktop as an icon - the kind people can shape as part of their own world. When I first looked at the Windows logo, I saw more than four tiled squares. I saw the space behind it, and the energy that shines through and gives it a sense of propulsion. The logo makes an impression with that use of curated perspective. In focusing in on the logo, we’re not just telling the story of Windows: we’re telling the story of everything behind and traveling through it, of the advances and techniques that keep the brand moving forward into the future. Our approach involved a live-action shoot using different variables and customizations. Our core concept wanted to position the logo as a portal into the world behind it. We customized and art directed each image to speak to the timelessness of Windows, and its ability to take us anywhere we want to go. We though the best way to achieve this is to build and shoot it practically. So we built the actual Windows logos and brought them to life through our use of inventive camera angles and evocative volumetric lighting. Using a 9k Phase One Camera system, we shot multiple exposures of the Windows logo, and combined those exposures in post to create a fantastic assemblage of volumetric lighting. The aim was to create a huge variety of desktop images, all of them real and practical, which in essence rendered the desktop image timeless. The final result was an image what was vivid and tangible, like you could reach into your screen and touch it. The advantage of doing this practically is that we can literally shoot thousands of images, which meant once we had our hero image, we kept shooting and got endless varieties out of each set-up. We wanted to create a whole library of images that can be used throughout multiple Windows applications. The Windows logo is a true icon. Using the best techniques available, we wanted to re-envision this classic image, defining what makes Windows 10 so forward thinking and accessible. We think our live action images will stand the test of time, placing this logo in a class of its own within the physical world. The Projector Beams approach was a cinematic technique that provided an expressive filter of light focused through a small “window.” Essentially, we took a piece of black cardboard and cut the Windows logo into it: four squares, each like a window in their own right. We then executed the same cut through a piece of acrylic and matched the two surfaces perfectly, creating a clear rim around the insides of the logo to catch light blooms and specular hits. We then projected projected light through the holes in the board, capturing it from an off-angle to give the image additional shape and texture, and to reveal the light source — which played up the idea of depth via our portal. This projected light source caught glints of the acrylic, giving us beautiful specular highlights to complement the beams of light that pass through the window. The light sources were from a standard Video Projector and one of Adam LaBay’s futureWeapon’s Laser Projectors - which created bold laser line work. The light for each of the four holes was then manipulated to be colored differently so that on their own, they represented one part of the logo. The projector beams were complimented with a natural fog that brought a dark, moody definition and a distinctive, provocative take. It gave the Windows logo a sense of mystery that’s powerful in its own way. With over 3,000 photos captured from the shoot, the initial stage of the composite was an exercise in patience as Munko diligently went through all of the assets and picked the best ones suited for the final image. He then dusted off his old 40 year-old designer fingers and brought them into Photoshop where he tirelessly combined exposures at a blistering 9k resolution. He first build up the base image, which was obviously the foundation for the hero still, flushing out the core logo design with a variety of laser-infused illuminations.. These core layers were varied, ranging from minimal rim-lighting to a multitude of laser lines fanning through the central portions of the logo, lighting up the volumetric haze in a variety of artful ways. Compositing all these layers together was an extremely iterative process and was done in collaboration with Daddy Bear Art Director Ryan Vulk and Creative Director Christopher Ashworth, the two senior Directors on the Windows Brand Team. Once the lovelies at the Windows team and up the ladder at Microsoft were happy with the aesthetics of the logo foundation, Munko then composited in the environmental passes, which consisted of separately shot layers of smoke and haze to create a very moody palette and accentuated the qualities of the practical approach. The final touches were the lens flares, which were again shot as separate passes but were flaring the lens with a light source positioned in the same place as the laser projector, so the flares lined up perfectly with all the other passes. The final grade was applied to bring everything into the signature ‘Microsoft Blue’ palette, but still leaving a tonal range that kept everyone happy. The final 9k file was then sent to the magicians at XYZ Creative Production Agency, who specialize in high-end photo retouching and did the final optimizations on the hero image. Collaboration was at the heart of this process, led by the great Doctor Joseph Picard who’s mind was a vital ingredient in developing the initial creative and techniques for the live-action shoot. Munko’s reps Tool of North America produced the job and assigned the lovely Mary Church to run the production. The Projection team was comprised of the great Adam LaBay and James Hurlbutt, and Aaron Fee was the delightful photo assistant assisting Doctor Picard on set. The shoot lasted two full days, and the team decided to have two sets running at once, where the team would alternating video and still photography sources; with Picard and Munkowitz wife-swapping the teams to keep things moving and the team extra productive. In the end, it was a very inspired set felt pure. Due to the massive nature of the job and the high stakes artwork being created, the team never felt the stress or magnitude of the exercise and focused on making the sweetest little images possible - hotness ensued.